Bardzo ładne mieszkanie na ostatnim piętrze z pięknym widokiem na wycieczki bez zapominając południa taras, spokój. Key Pad. Winda. Widok ogród plac. W pobliżu poborów parku, ogrodu botanicznego i niedaleko centrum miasta, 5 minut autobusem (dolne budynku) 15 min spacerem i Vinci International Convention Center. Piękny pokój dzienny (rozkładana sofa dla 2 osób), w pełni wyposażona kuchnia, łazienka 2 umywalki i sypialnia (łóżko 160), wszystkie bardzo ładnie urządzone. Sklepy w pobliżu. Wygodny parking. Bus u podnóża budynku. Idealny na zwiedzanie z przewodnikiem, zamki nad Loarą i odkryć bogactwo i piękno tego regionu są one architektoniczny, geograficzne, historyczne, wina, w najlepszych możliwych warunkach. J'ai loué cet appartement pour mes 2 filles et moi. Appartement bien placé, coquet, calme et très bien entretenu. Tout le nécessaire pour passer un bon séjour. Le canapé lit du salon est très confortable. Petite terrasse pour se détendre, bien agréable. La propriétaire est disponible et charmante. 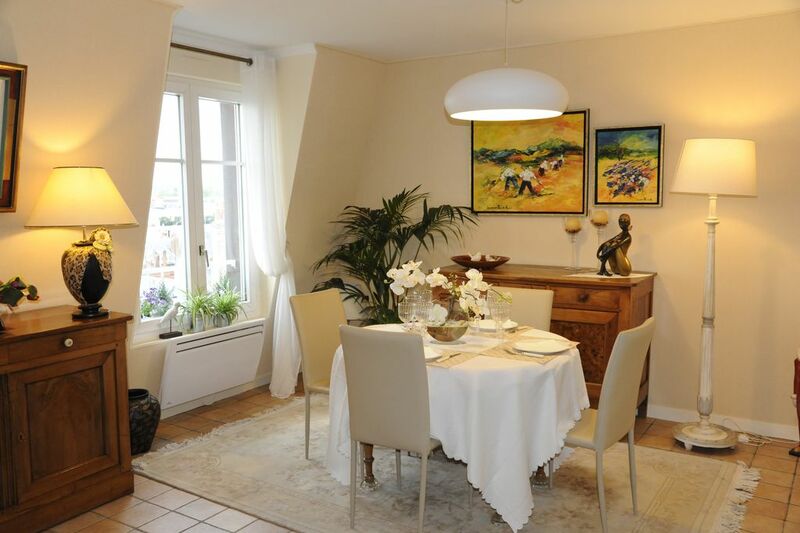 We chose this apartment for its location for touring the Loire Valley. However, other than being central to the locations we wanted to visit, it is hard to find anything good to say about the apartment. The on-line listing indicated “on-site parking” which, technically, is true in that there is a car park at the back of the block, however, access to the car park is pass controlled and guests are not provided with a pass. The listing also indicated parking immediately outside the apartment – not true – this is a layby for deliveries only limited to 15 minutes. The parking is diagonally across the cross roads, in a public car park outside a school but don’t park there on a Saturday night as the car park is used for the local market on a Sunday. There are parking spaces around the square but these places are taken up by the local residents. We were handed a blue folder with “instructions” for the apartment that covered things such as watering the plants but nothing on how to use the very high tech hob and oven. When we got plates out to have a meal on our first night, both the plates and cutlery were dirty. These were shown to the lady who came to collect the keys at the end of our stay but, with her not speaking any English we're not sure that she understood. The bathroom “door” is a recycled industrial sliding door that is very heavy and difficult to use. The apartment does not have air conditioning and there are no obvious means of keeping the apartment cool – during our stay, temperatures were often 32°C and higher (as forecasted locally). We sent a request to the owner for a fan only to be told that they were not expecting it to be that hot ! The bed was very soft & uncomfortable, one of the bedside lights was not working and no dressing table. The lift is very slow & access to the stairs was locked all the time we were there - major safety issue. The apartment has a dishwasher but no dishwasher tablets were left available. There was an ironing board but no iron which also confused the owners friend. What is not apparent from the online listing is that the owner lives in the apartment, vacating it for bookings. However, she locks a lot of the cupboards & drawers before vacating so guests have minimal storage space. What a surprise this comment? Since I rented my apartment I got only very good, for an average of 4.5 to 5 stars. Passing a very difficult family time (a loved one being dead). I warned the tenants by telling them that it was my friend who would receive them but especially that she lived half an hour from home, I thank them for calling or email him half an hour before, what they have not done. They called once at the bottom of the building. Their expectation is therefore theirs. This friend has some notions of English (she also uses a translator on her phone to communicate) I absolutely trust her. A blue folder is available to tenants or all instructions for the apartment are written in English (life in the apartment, terrace, parking, supermarket, bus, tourist documentation etc ....) A white binder is handed also containing all the instructions for using the machines. parking: there is a large parking space in front of the school and parking all around the free building. (See the comment on this topic from previous tenants. The bed: 160 new bedding / bathroom door: made by a craft / dishes: a dish badly washed in dishwasher (it happens) / air conditioning: could not ignore it because the announcement specifies no air conditioning ... . I will not answer any more, I do not wish to argue about this certain bad faith. I leave future tenants the opportunity to build on the other complimentary comments I've had. I nevertheless wish a good continuation in their life to these people. Quiet, well furnished apartment. Very kind owner. It is 10 minutes from the town center by bus number 5, comfortable even on foot. I very much enjoyed my stay and would recommend the apartment for anyone interested in the wine and chateau region of the Loire Valley. The apartment is "lived in" in a good way--it's beautifully decorated, the sleeping arrangements are comfortable, the kitchen well stocked should one decide to prepare meals, and the little terrace is a lovely spot for breakfast or an afternoon glass of wine and some cheese. There is a wonderful farmer's market right across the street on Sundays that will give you a real taste of every day life in France. Schöne, ruhige, zentral gelegene Wohnung mit Dachterrasse und schönem Blick über die Stadt. Vollständig eingerichtete Wohnung im 5. Stock (Aufzug) zur Alleinbenutzung. Fahrräder konnten in der Tiefgarage abgestellt werden. Vermieterin antwortete stets umgehend bei Fragen. Gemütliche Dachterrasse.